This rustic chalet is an ideal way to experience the beauty of the British Columbian wilderness. At the chalet you'll find a 10 person sauna, change room, and hot shower. It's off-grid with solar power and a wood burning stove (with a propane furnace backup); all the food is provided and you've got two guides for your backcountry adventuring. Bring a sleeping bag and your own sheets. Good for groups of 12 to 14. This place books out in terms of trips and experiences so you can't really just plan a weekend -- check what they've got planned for the season! A modern, airy cottage with panoramic views of the ocean from every corner. Located on the Sunshine coast of BC, you'll find 600 sq ft of quiet solitude and direct beach access. You'll want to book out your ferry early but it shouldn't be much of a problem to get there from Vancouver (just look up the Horseshoe Bay to Langdale ferry). Plan a romantic weekend away and get ready to cozy up and watch some stunner sunsets. On the southwest tip of Vancouver Island, between Port Renfrew and Victoria, you'll find this 3 bedroom cabin that sleeps 8. Modern, but still warm, you'll feel like you're in the forest here and it's no surprise considering how many windows you've got. It's gorgeous and with that cozy wood burning fireplace you won't want to ever leave. 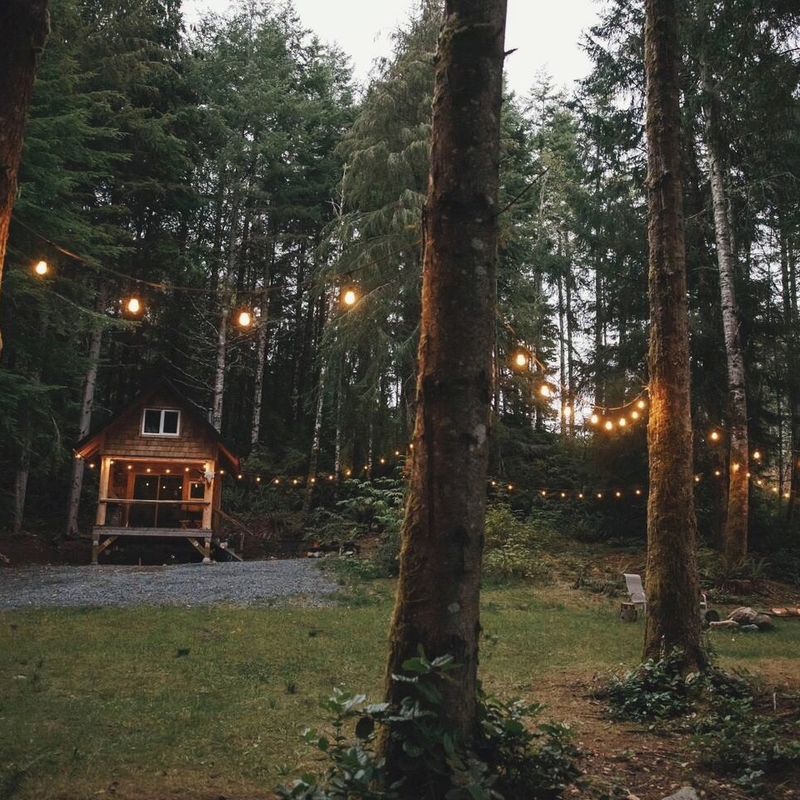 On the west coast of Vancouver Island, in Jordan River, you've got this rustic retreat with adorable shingles and a swingy hammock (plus an outhouse). 2 bedrooms for 4 guests, on a heavily forested 2 acre property, you'll easily find beaches, hiking, and any other sort of trouble you might want to get up to. The area is remote so don't expect cell service (download directions before you get there) and make a point to stop for all provisions before arriving. So this place is really cool, but it's for a very particular human. Two ferry rides from Campbell River, which is about halfway up Vancouver Island, on the eastern side; you'll eventually make your way to Cortes Island and this 10 acre waterfront cottage in the forest. Here's the thing: this place is awesome and it's definitely worth it but there isn't a lot of support happening. You'll have everything you need -- kitchen, bathroom, beds, etc -- but you have to launder your own linens (at the laundromat) or bring your own, you also have to take the trash to the dump, do the dishes, and empty the toilet bail before you go. That being said, you're on the water, nuzzled among mossy bluffs and there's just about no one to bother you. Sounds like a fair trade. Sleeps 4. 1 bedroom (2 rooms). You know when you find a place that immediately goes on your "One Day" list? This is that. Rustic, private, and right on the water, it's surprisingly easy to get to and is begging you to be as active as can be during your stay. Turns out it's on a private island, just 4 km from downtown Squamish, and they provide you with paddle boards and canoes. Even though it's only 1 bedroom (there's a loft), they have two beds, a deck, simple kitchen, and not much else --- aka it's simple but not roughing it.